Reach the summit of Mount Katahdin along this formidable loop that climbs cathedrals of rock and crosses a knife’s edge ridge. Named by the people of the Penobscot Nation, Katahdin, which translates to “The Greatest Mountain,” was home to the thunder god Pamola, a fearsome spirit that protected the mountain and deterred anyone from climbing to the summit. Rising above the lakes and forests of central Maine, its iconic silhouette defines the horizon for miles in every direction. 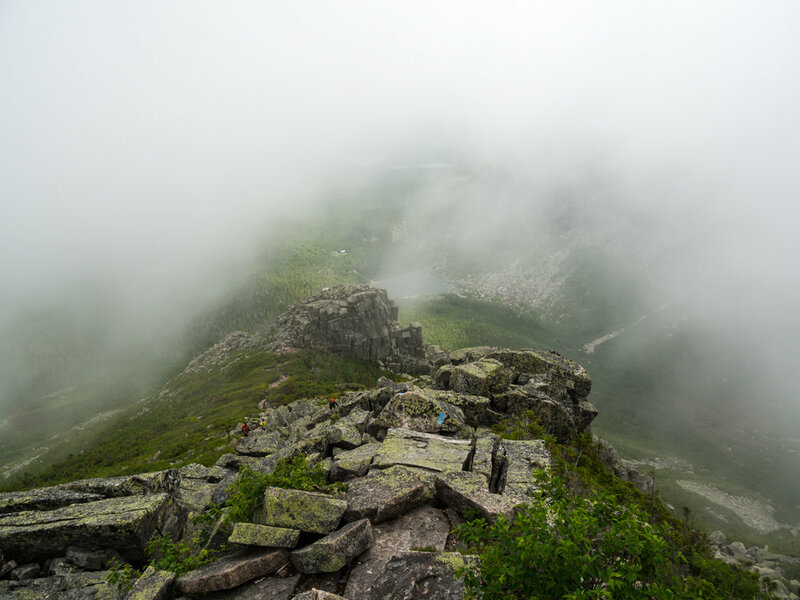 The mountain holds a number of other accolades: Maine’s highest peak, the northern terminus of the Appalachian Trail, and centerpiece of Baxter State Park. Famous historical visitors have included Henry David Thoreau and Theodore Roosevelt. 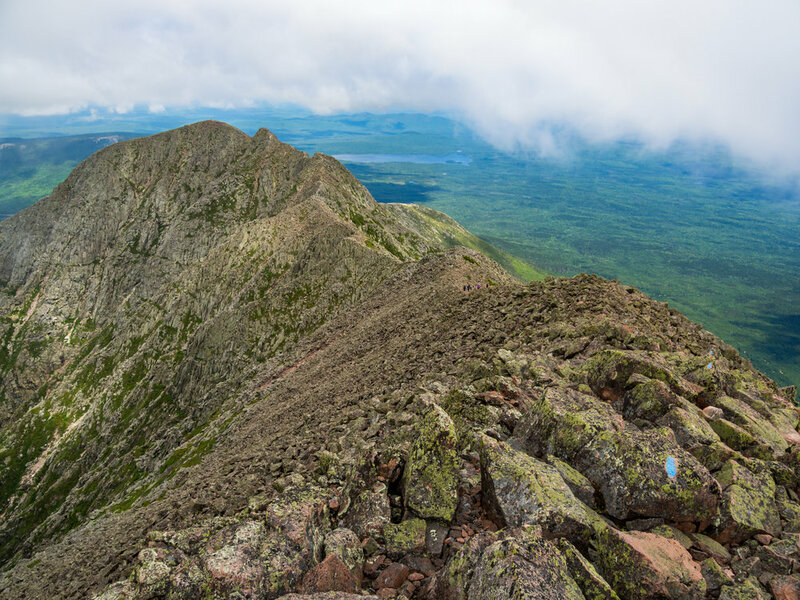 There are several trails that lead to and from the summit of Katahdin, but the Knife’s Edge trail may be the most infamous. While all the routes to the top require some form of scrambling, the Knife’s Edge connects Pamola Peak to Baxter Peak along a narrow, mile long precipice of rocks and boulders. The mountain falls away dramatically to either side of the trail, as narrow as 3 feet in some sections, as it arcs around to the summit, often shrouded in clouds and fog. For a strenuous but rewarding loop hike that incorporates not only the Knife’s Edge but also the Cathedral trail (another thrilling climb up Katahdin’s steep slopes), head to the Roaring Brook section of the park, where you’ll find a campground and day use parking. Get an early start and head up the Chimney Pond trail, gently climbing into the forest alongside Roaring Brook, quickly passing a junction with the Helon Taylor trail. The grade remains relatively easy, with sections of bog boards and wider boardwalks spanning several creeks flowing down from the mountain. After a couple miles, the path skirts around the edge of the Basin Pond, then passes a cut-off for the North Basin trail. Continue about another mile to Chimney Pond campground. View of the Knife’s Edge from Chimney Pond campground. The start of the climb along the Cathedral trail. A view into the valley from the Cathedral trail. A view from the South Peak of Katahdin. The Knife’s Edge looking toward Pamola Peak. A section of the Helon Taylor trail. Chimney Pond is situated at the bottom of Katahdin’s Great Basin, surrounded on three sides by the towering ridge that connects the mountain’s lofty summits. Standing on the shore of the pond, the next few miles of your hike are visible in one sweeping panorama. The first ridge to your right, with three prominent buttresses of rock known as the “cathedrals,” is the shortest route to the top. From there, trace the spine of the mountain over Baxter Peak, Katahdin’s highest summit, and along the jagged Knife’s Edge to Pamola Peak on your left. The Cathedral trail begins near the ranger cabin just before the pond, quickly approaching the base of a boulder field. From here, the next mile of trail is not so much of a hike but a steep rock scramble above the tree line, ascending over 2,000 feet. On a clear day the view of Katahdin’s northern basins and peaks is stunning, boulder strewn slopes pushing up out of dense wilderness spotted with the occasional secluded pond. As you climb and hike in this alpine environment, try and remain on top of the rocks and avoid trampling the fragile vegetation. After reaching the top of the last “cathedral,” continue past the weathered trail signs marking another cut-off, and hike to the junction with the Saddle trail. The summit of Katahdin, Baxter Peak, is a short hike from the junction, marked with a large rock cairn and the iconic wooden sign designating the northern terminus of the Appalachian Trail. The Knife’s Edge begins just past the summit cairn, following along the ridge. On either side, the precipitous slopes of the mountain drop away to the valley below. After 0.3 miles, the trail crosses over Katahdin’s South Peak, only 7 feet lower than Baxter Peak, before descending slightly as the ridge curves around the basin, Chimney pond nestled among the trees. To the east, the woods and waters of Maine stretch to the horizon, dwarfed by Katahdin’s colossal mass. The second half of the Knife’s Edge grows more difficult, culminating in several steep ascents and descents up and over Chimney Peak and to the top of Pamola Peak, where the route meets the Helon Taylor trail (and the now permanently closed Dudley Trail). Take in your last views of Katahdin’s slopes before following the Helon Taylor trail east along the ridge, descending steadily towards the tree line. After a couple miles, the grade levels out somewhat after entering the forest, continuing toward Roaring Brook for a total of 2.8 miles. The trail terminates at the Chimney Pond trail which leads back to the Roaring Brook parking area. Hiking to Katahdin’s summit is well worth the effort, but its difficulty shouldn’t be underestimated. The Knife’s Edge trail presents additional dangers, and should be avoided in bad weather. Even on a good day, heavy winds are likely, and the mountain’s summit creates its own weather, often shrouded in clouds when the surrounding valley is bright and sunny. Morning fog usually burns off in the afternoon, but the exposed ridge line is not a place you want to get stuck as night descends. Always be sure to give yourself enough time to complete the hike. Pack extra layers, food, and a headlamp. Be sure to sign the trail registers at Roaring Brook and Chimney Pond. A view of Chimney Pond and the Great Basin from the Knife'e Edge. Distance: 8.2 Miles round trip. Difficulty: Very Strenuous, with difficult, steep rock scrambling and 3,900 feet of elevation gain. 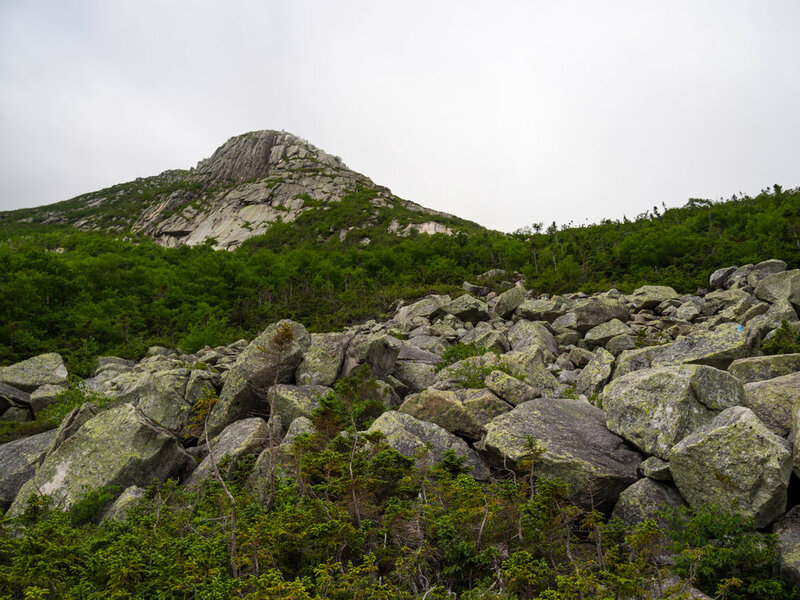 Route: From the parking area, connect the Chimney Pond Trail (3.1 miles) to the Cathedral Trail (1.0 miles) to the Saddle Trail (0.2 miles) to Baxter Peak summit. From the summit, follow the Knife Edge Trail (1.0 miles) to the Helon Taylor trail (2.8 miles) to the Chimney Pond trail (0.1 miles) back to Roaring Brook. Permits/Fees: Entry fees for Baxter State Park are $15, with overnight stays ranging from $12 for a spot in a bunkhouse, $32 for a standard campsite, to more expensive cabins. Overnight Possible: Yes, check out Chimney Pond Campground, a 3.1 mile hike from Roaring Brook. Lean-tos and bunkhouse available. Reservations must be made by phone, mail, or in person. Best Time To Go: For a summit of Katahdin, mid to late summer is best. While busy in the park, it offers the best hiking conditions. Baxter is open for camping from May 15 to October 22, and December through March for limited winter use. Be sure to make reservations early, and if planning on just entering for day use, expect a line of cars. The park often fills to capacity during summer days, so plan accordingly. Where to Poop: Privies are located at Roaring Brook and Chimney Pond Campgrounds. Avoid doing your business in the backcountry due to heavy trail use and fragile alpine environments.